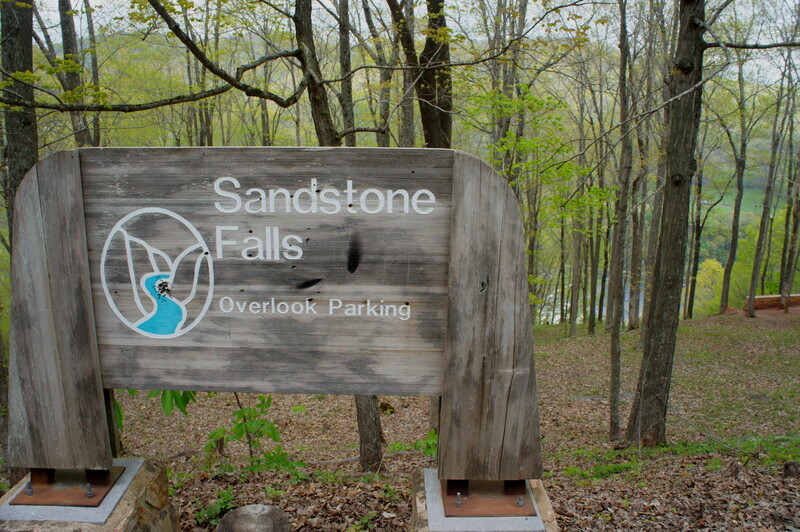 Sandstone Falls Overlook is an underwhelming hike in an otherwise overwhelming park. High above West Virginia’s gorgeous New River Gorge, the overlook offers only a sliver of a view, just enough to see 25-foot Sandstone Falls at a great distance. It’s probably better to venture down to river level and try the Sandstone Falls Boardwalk along New River Gorge’s River Road. The upside, however, is that the hike to Sandstone Falls Overlook is a mere 1/10 mile and thus a short stop on the way to more inspiring destinations. 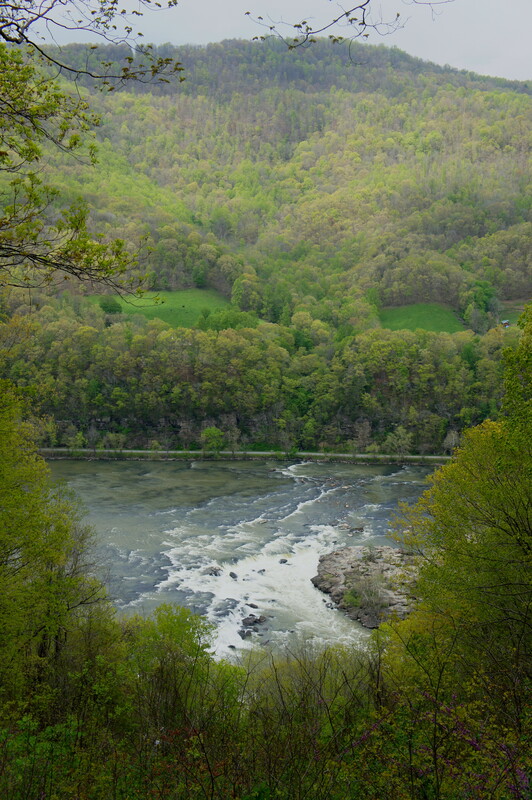 It begins at the Sandstone Falls Overlook parking area, situated just off Route 20 two miles south of Sandstone, West Virginia and 7.5 miles north of Hinton. There are bathrooms at the route’s start. The graveled trail drops steeply from the parking area, rounds a single switchback, and ends at the overlook. 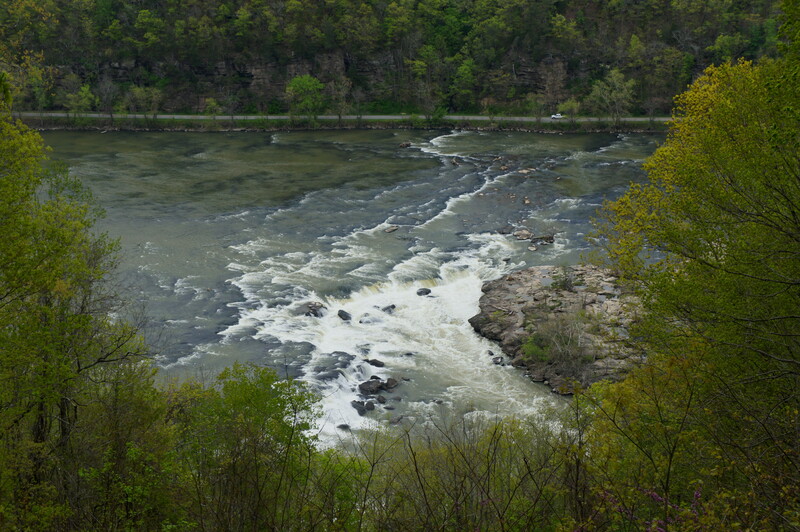 From here, it is easy to spot the whitewater of Sandstone Falls 600 feet below. True to its name, the falls tumble over some of New River Gorge’s best exposed Stony Gap Sandstone. This rock dates to the Mississippian Period, some 300-350 million years old. After taking in the view, return—up the steep hill—the way you came. This entry was posted in Easy Hikes, New River Gorge National River, West Virginia and tagged New River Gorge, Sandstone Falls, Sandstone Falls Overlook, Sandstone Falls Overlook Trail, Stony Gap sandstone, waterfall, West Virginia. Bookmark the permalink.